It’s a funny thing, coming home with a suitcase full of treasures from a delightful adventure abroad. The less common the destination and the more distinctive the treats acquired, the more nerve-wracking it can be to decide when will be the ideal/perfect/best moment to enjoy them. From this fall’s explorations in Portugal and the northwest corner of Spain, I came home with a couple dozen tins of exquisite seafood (sardines, tuna, octopus), for instance, much of it from this amazing little shop in Lisbon. I’ve given a few of the tins as gifts but have yet to try any myself, waiting for some undefined “right moment.” But life’s too short and there’s no time like the present, so I’ll have to just tuck into a couple of them soon. 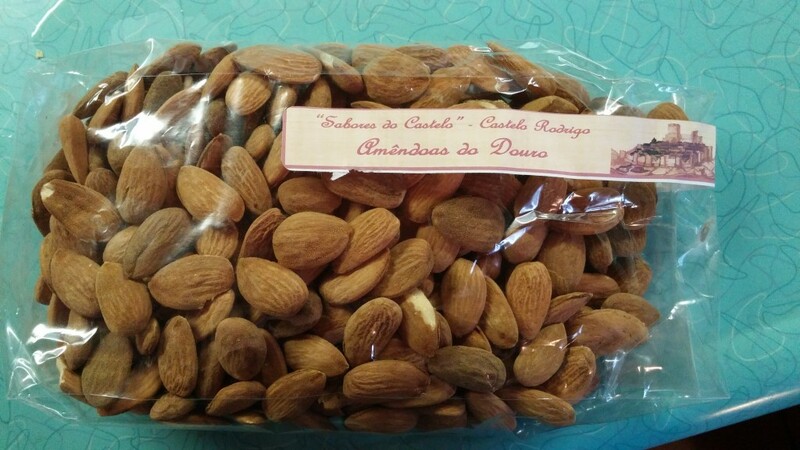 Another treasure was some almonds I’d picked up on an excursion in far eastern Portugal, a day trip from the cruise we were taking along the Douro River. The river is well known for its wine production, but we’d seen almond trees along much of the terraced hillsides for the previous day or two of cruising and learned that almonds are an important crop here as well. In the historic village there were a few small retail shops, one specializing in almond products (and, as it happens, owned by a Frenchman, which made my happy to be able to converse in a language I know!). Most of my fellow cruise mates were stocking up on the many flavored almond options, but I hunted out the plain almonds in their natural state. I knew I’d want the flexibility to later decide how I wanted to enjoy them, in a savory snack, as a sweet treat, maybe some of each. So the holidays snuck up on me and there were those almonds, and it seemed a prime time to take advantage of that stash. I wanted the almonds to shine, not be ground up for a cake batter or otherwise melting into the background. And though candy is usually the last thing I think about (unless maybe caramel), it seemed the proper platform. A good nut-packed nougaty recipe in particular struck my fancy. So I hit the interwebs to find some options. My radar landed on this recipe which read well (I liked the addition of orange and vanilla), quite randomly on a site that’s a magazine for Dolce and Gabbana–the closest I’ve been to fashionable any time in recent memory. It’s Italian rather than Spanish (turrón) or Portuguese, but not too far afield. First step: blanch those darn treasures. Which at first blush might sound more like hard labor punishment than simple culinary chore but it’s much easier than you might think. Bring a big pan of water to a boil. Add the skin-on almonds and boil for about a minute. Drain, and when cool enough to handle start peeling. It’s as simple as picking up an almond between thumb and forefinger toward one end (I think the broad end works best), and squeeze. Out will pop the naked almond, though be sure you’re pointed downward into the colander or another bowl lest your work go flying across the kitchen. Then because the almonds are now a bit damp and the chemistry of water and sugar is not one to mess with, I scattered them on a baking sheet and dried them gently in a low oven for an hour or so, then let thoroughly cool. 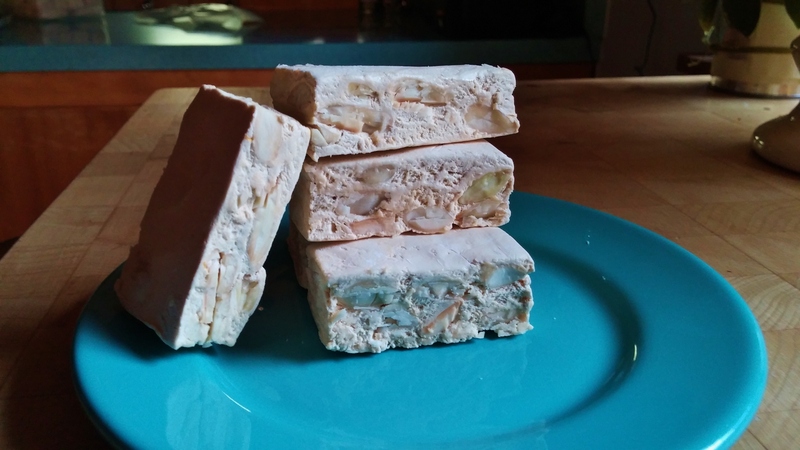 So, here’s my take on that recipe, of which I ate far too many myself (which is saying a lot for this anti-sweet-toother) but did get raves from the few with whom I shared some. Next time I shall force myself to package up most of the treats and deliver them to family and friends. Preheat the oven to 350°F. Lightly dust a clean work surface with cornstarch. Line a 9- by 13-inch baking dish with parchment paper, letting excess paper hang over the edges. I ran the paper down the full length of the pan, not worrying about the sides, which I very lightly oiled. Spread the nuts on a rimmed baking sheet and lightly toast, stirring once or twice to encourage even toasting, 10 to 12 minutes. Set the nuts aside to cool. Combine the egg whites and salt in the bowl of a stand mixer fitted with the whisk. In a heavy medium saucepan with a candy thermometer attached (definitely use a thermometer that attaches to the side of the pan, holding a small instant read over molten sugar can prove painful! ), heat the sugar and honey over medium heat, stirring with a wooden spoon until the mixture begins to simmer and the sugar is mostly dissolved, about 10 minutes. Continue to cook, stirring occasionally, until the temperature reaches 315°F, stirring a bit less frequently and much more gently as the temperature rises. It may take about 15 minutes to reach this point, the mixture will foam a bit and darken in color along the way. As the sugar mixture is cooking, beat the egg whites on medium speed until firm peaks form. Add the powdered sugar and continue to beat until fully incorporated, about 1 minute longer. Turn off the mixer and let sit until the sugar mixture is ready. When the sugar mixture as reached 315°F, take the pan from the heat and gently stir until the temperature reduces to 300°F, a couple of minutes. Carefully remove the candy thermometer. Turn the mixer to medium speed and slowly pour the hot sugar mixture down the side of the bowl into the egg whites. The egg whites increase in volume, then decrease a bit. Continue to beat until the mixture has cooled to just warm to the touch from the outside of the bowl (but don’t test that right away as the bowl will be quite hot!) and has lightened in color, 10 minutes or so. Add the vanilla and orange zest and beat for 1 minute longer to incorporate. Take the bowl from the mixer and use a wooden spoon or a sturdy heatproof spatula to stir in the almonds. The mixture is quite sticky at this point. Turn the mixture out onto the cornstarch dusted surface and dust your hands with cornstarch. Lightly knead the mixture for a few moments, then transfer to the prepared dish and use your cornstarch-dusted hands to press it out evenly to flatten and fill the pan. Set the pan on a wire rack and let cool completely. Using the parchment paper overhang, lift the candy from the pan and set on a chopping board. Cut the candy into pieces, about 3/4 inch by 2 inches or whatever suits you. Here the original recipe says to layer in an airtight container (which I did, with pieces of waxed paper between to avoid sticking) and to store sealed, at room temperature to dry at least 8 hours or overnight. I’m not sure the necessity of that and glancing through a range of other torrone recipes, I don’t see that replicated much. Being impatient to try my new candy, I tasted a piece not long after cutting and it was perfectly delightful. A day later, the texture was perhaps a bit more firm (in a pleasant way) but not wildly different. So I say, soon as they’re cool and cut, feel free to indulge! But do store in an airtight container, or wrap well in plastic, to hold. Apparently they’ll keep well for two to three weeks. I wouldn’t know. I am most definitely going to be making this again. Hoping I don’t find that the ease and deliciousness of this first try at candy making was a fluke! But those almonds lovingly carried home from Portugal? They’re special in their provenence and the memory that carries from a wonderful vacation. Not the culinary epiphany I’d have thought they might be. I’ll let you know how I feel about all those tins of seafood brought home once I dig in!